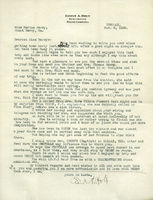 A letter thanking Miss Martha Berry for the hospitality afforded Frank and his family and friend on their visit and stay at the sunshine cottage at The Berry Schools. 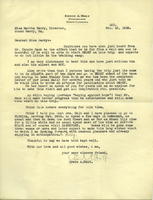 Also regret that Miss Martha Berry's absence made it impossible for them to meet her. 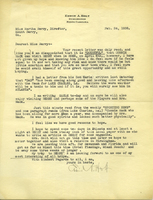 A letter thanking Martha Berry for her kindness during their visit and expressing her enjoyment of preaching at the Chapel during the same visit. 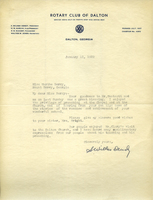 A letter to the Director of Publicity at Berry from Warren Duffee, Cobb County Times News Editor, asking if his party can visit the campus and what accommodations they would be able to use during their visit. 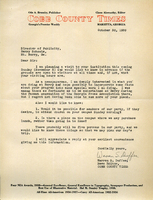 A letter expressing how much Mr. and Mrs. Hoppin enjoyed their visit to Berry the previous Spring, in addition to two donations of $100. 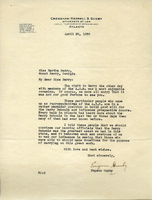 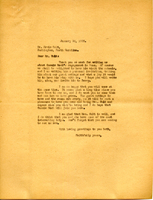 A letter to Miss Martha Berry informing her of his plans for his visit to Rome on April 6th, and his fear that he might not actually be able to come at that time because his fear that Connie Mack might not be up to it. 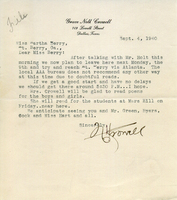 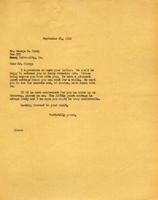 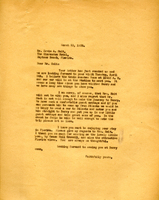 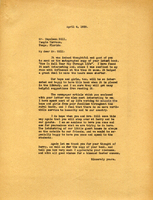 A letter informing Mr. Holt of an invitation Martha Berry's extending to Connie Hack to visit the Berry Schools.